Ninety-four cowboys and cowgirls from across North Dakota and South Dakota are dreaming of gold buckles. Pro rodeo's regional championship takes place next weekend in Minot, and those cowboys and cowgirls have punched their tickets to the Badlands Circuit Finals Rodeo October 9-12. Winners will be crowned in each of seven events, with the champions winning gold buckles and the chance to go on to the Ram National Circuit Finals Rodeo in Kissimmee, Florida, March 25-28, 2015. Headlining this year's list are two South Dakota contestants who will compete on the national stage for a pro rodeo world title. 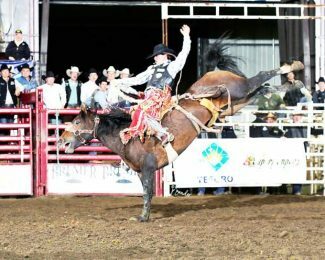 Lisa Lockhart, Oelrichs, S.D., is headed to her eighth National Finals Rodeo (NFR) this December, as is Cole Elshere, saddle bronc rider from Faith, who will compete at his third NFR. Competitors from the Camp Crook/Buffalo area include steer wrestler Forest Sainsbury and barrel racer Jessica Routier. Tickets are available for the Ram Badlands Circuit Finals Rodeo, hosted by the Minot Y's Men's Rodeo. The rodeo, held October 9-12 at the State Fair Center in Minot, determines the year end champion for all pro rodeos in North and South Dakota. The rodeo will pay out over $130,000 and will determine the year end and average winner in each event, who will represent the circuit at the Ram National Circuit Finals Rodeo next spring. For more information on the rodeo, visit http://www.minotysmensrodeo.com or call 701-852-5577. 11. Brady Wakefield, O'Neill, Neb. 9. Levi O'Keeffe, Mohall, N.D. The Association created the PRCA's circuit system, consisting of 12 geographic regions that include as few as one state or as many as 13. Each PRCA cowboy in the United States chooses a home circuit at the beginning of the year or is assigned to one that corresponds with his home address. Cowboys compete for points throughout the year and points earned within his circuit are applied toward the standings of his respective circuit. Each circuit's top cowboys in each event qualify for that circuit's "Finals" at the end of the season. After all 12 circuit finals are completed, the top regular-season cowboys in each event and the winners of the circuit finals qualify for the Ram National Circuit Finals Rodeo (RNCFR), held in Kissimmee, Florida, March 25-28, 2015. North and South Dakota's 24 pro rodeos make up the Badlands Circuit. Badlands Circuit contestants must compete at the Badlands Circuit Finals Rodeo to qualify for the RNCFR. The Minot Y's Men's Rodeo will host its seventh annual Badlands Circuit Finals Rodeo October 9-12, 2014 at the State Fair Center in Minot. There, Badlands Circuit cowboys and cowgirls will compete to earn a berth at the Ram National Circuit Finals Rodeo. Two competitors from each event: the year end champion and the average champion, will go on to represent the Badlands Circuit at the RNCFR.